The "Payments" settings tab is where you can configure your payment gateways and other settings. The first two settings allow you to select your currency, and the currency symbol position (before or after the price). The next section down allows you to select which payment gateway(s) you want to enable on the registration form. You may select only one or multiple gateways. Right below the gateway selection is a checkbox to toggle sandbox mode on or off. Sandbox mode is incredibly important for testing to make sure payments work before you switch your site over to live. The rest of the payments page consists of settings for individual gateways. You need to configure your usernames and/or API key(s) for each payment gateway you've selected. 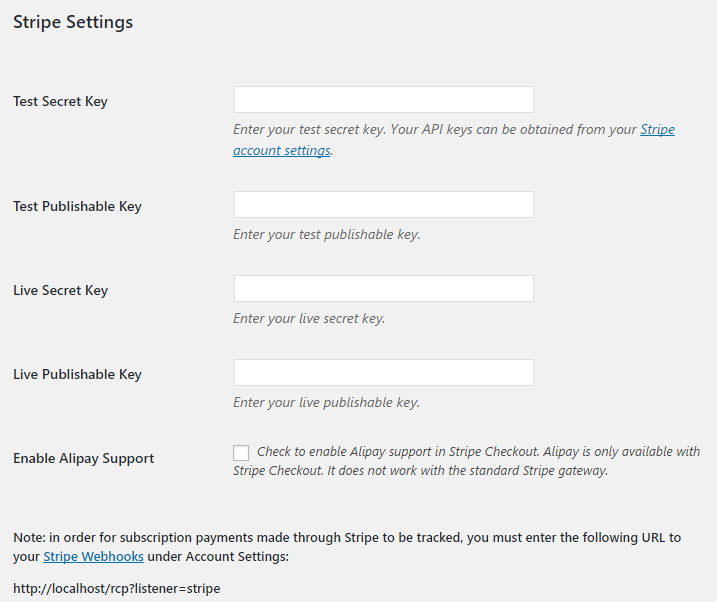 For example, if you've enabled Stripe, you need to go to the "Stripe Settings" area and enter your API key details. The Stripe gateway won't work correctly until these details are entered. Be sure to enter both the "test" and "live" details where appropriate so you can process payments in both sandbox mode and live mode.